We live in a hop focused beer world. There’s nothing wrong with this of course, at GBH we like our pales and IPAs as much as anyone else. We do worry, however, that some of the other wonderful ingredients which make up our favourite beverage too often get overlooked. 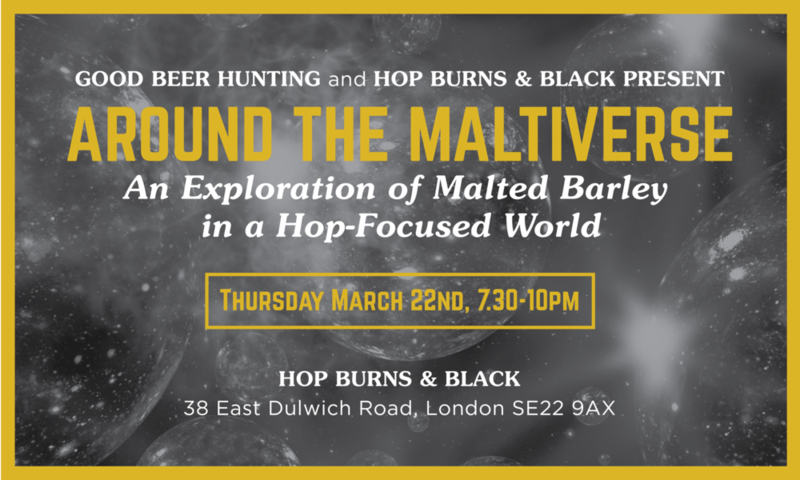 Join Good Beer Hunting’s Matthew Curtis and Claire Bullen for a talk and tasting that will explore four different beer styles that showcase how malt is used in brewing to evoke completely different flavours. This is the third part in a series of tastings that take a closer look at the fundamentals of beer, whether they might be malt, hops, yeasts or even adjuncts. In the Good Beer Hunting tradition we’ll be pouring samples of beer liberally and we’ll also provide a small food pairing to try alongside one of the beers (it won’t be substantial however, and we do recommend eating before you arrive). Tickets are just £16.50 (plus booking fee) per person—however if you’re a member of our Fervent Few subscriber community we’ll give you a code for 10% off the ticket price. We look forward to sharing a few excellent malt-forward beers with you down at Hop Burns & Black soon!